After much thought and consideration, I’ve decided to stop blogging. Technically I haven’t been blogging too much lately anyway. But I want to make it official. Here’s why. 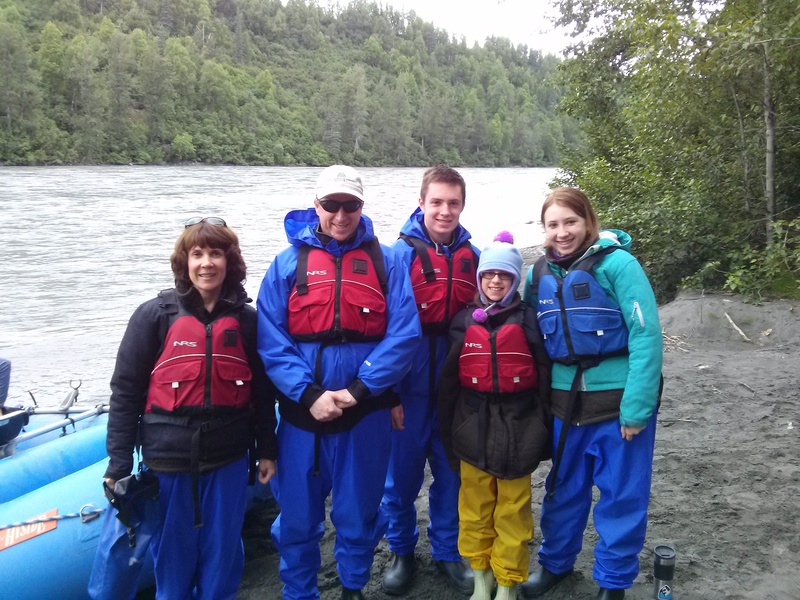 My family and I have been in Alaska for nearly three years now, and I don’t really have too much new to write about. This state is amazing, and we love it. We hope to be here a good long time. God willing, we will be. I started this blog to have a forum for talking about our transition back to America after living overseas for four years. And to share my discoveries of this awesome state, which is really like its own country. 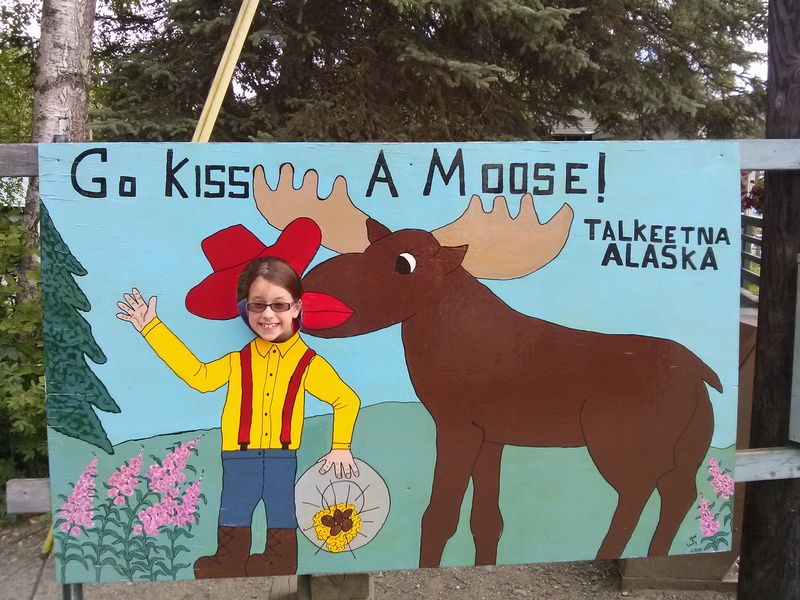 I know there is much more to Alaska than I have blogged about, much much more. But I don’t want to keep writing the same things about the snow, or posting yet another picture of moose. Although both are very Alaskan. There’s always a lot going on within my family, but that’s really not the purpose of this blog. I think the blog has run its course, and this season of transition is complete. So thank you to everyone who has read my blog and offered comments. It’s been fun but it’s time to put it to rest. I’ve been blogging for nearly seven years and I feel that it’s time to let it go now. If you’d like to keep up with my family and me, you can find me on Facebook. Just send me a quick email and I’ll make sure to add you to my Facebook friends. And who knows, someday I might get the urge to start a new blog. It’s been fun. But all good things must come to an end, right? God bless you all. Summer has flown by, as usual. Each summer seems to be busier than the last. But I can’t complain, we had amazing weather and some fantastic experiences. Since my last post nearly a month ago, we’ve had lots going on in our family. Kyle’s friend from the Lower 48 stayed with us for a week, Sarah went to Victory Bible Camp for two weeks where she participated in their Servant and Leadership Training program (SALT), and my parents flew here from Arkansas to stay with us for three weeks. While my parents were here, we celebrated two wedding anniversaries. Mark and I celebrated 24 years of marriage and my parents celebrated 48. Forty-eight years! Kind of makes our 24 not quite as impressive. Some of the activities we did with my parents included hiking, going to Walmart half a dozen times, going to Costco to get them new cell phones, going to the AT&T store to figure out the new cell phones, and taking a couple of scenic drives. We also drove downtown to see all the beautiful flowers and to catch a glimpse of salmon swimming in a river that runs through the downtown area. Here’s a photo from our hike – sorry, there are no pictures of Costco and Walmart. The Thunderbird Falls hike is one of my favorites. There is a waterfall at the end of the hike and the scenery is spectacular. One Sunday afternoon we drove to a wildlife preserve to see moose, bears and caribou, among other animals, in their natural surroundings. And we saw moose in other surroundings – my neighborhood. Mark, Kyle and Dad went on a man’s weekend fishing trip (at 3 am) while we girls went to garage sales, a fabric store and had lunch at a Thai restaurant. 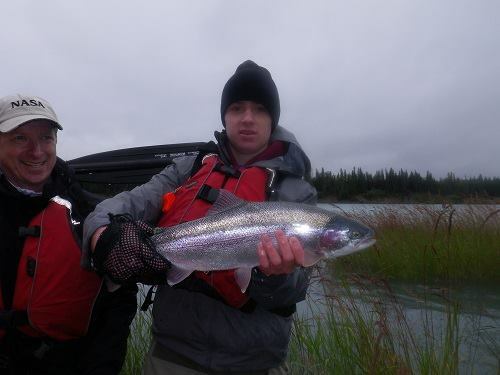 We all had fun on our separate outings, and once again Kyle caught an impressive fish. My mom was a very busy seamstress while she stayed with us. She sewed two tablecloths for me, three skirts for Kate, and a skirt for Sarah (and gave Sarah sewing lessons along the way). She added trim to one of Kate’s t-shirts to match one of the skirts. She made two slip covers for sleeping mats that I bought for the kids to use when they have sleepovers or just to throw down on the game room floor when they’re playing. 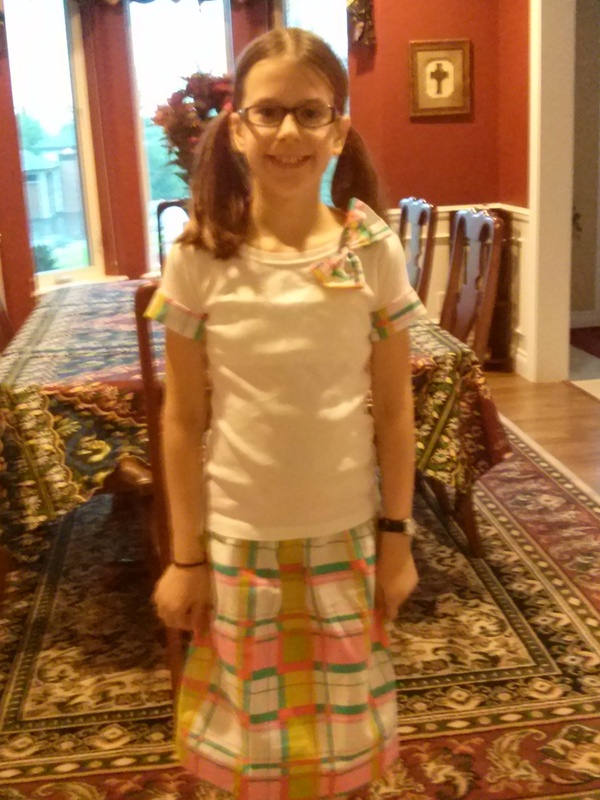 Kate is wearing the skirt Grandma made and top that she embellished. In the background is one of the tablecloths she made. Sorry for the blurriness of the picture. My dad, ever the handyman, figured out how to adjust the brakes on our riding lawnmower (Mark had been using it with varying degrees of risk due to a brake issue), repaired our treadmill (that conveniently died only a few days after they arrived), helped Kyle re-assemble his x-box (Kyle took it apart to retrieve a stuck game disc, only to discover that he couldn’t put it back together again), tightened a few wobbly toilet seats, and fixed a shower head. And fixed Kate’s closet door, and probably a few other things that I forgot to mention. My mom rescued some plants outside and she and dad picked up branches and put them through the wood chipper and otherwise helped out with yard work. So they definitely earned their keep! 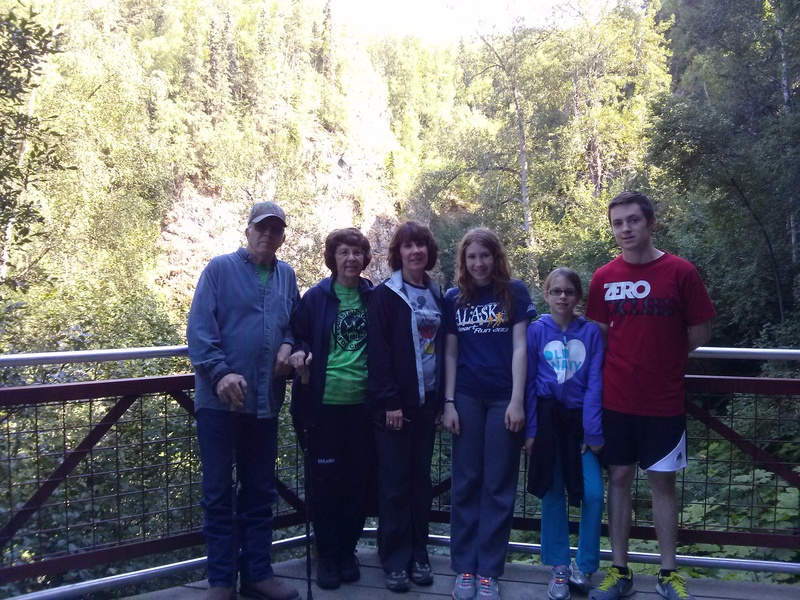 They ended their visit with an Alaska Railroad trip to Denali. They had great weather and met lots of interesting people, paid too much for food and lodging, and saw plenty of wildlife. Now they’re back home, and it’s time for another school year to begin. With two kids in high school and one elementary-age, it’s sure to be another flurry of activity, there’s no doubt about that. Maybe things will slow down for me by the time I reach my 48th wedding anniversary. Remember that quirky TV show Northern Exposure, set in fictional Cicely, Alaska? We went there last weekend. Or went to the town that was the inspiration for the show, anyway, according to some. The little town of Talkeetna, with about 800 or so residents, is about a hundred miles north of Anchorage and has been on my list of places to visit for some time now. It’s truly charming and yes, very quirky. They elected a cat mayor, for heaven’s sake. Mayor Stubbs, a big orange tomcat who freely roams about town, was a write-in candidate for mayor and as of now, still holds the honorary title. We saw him (and his lack of a tail, hence the nickname) while we were there but unfortunately I didn’t get his picture. 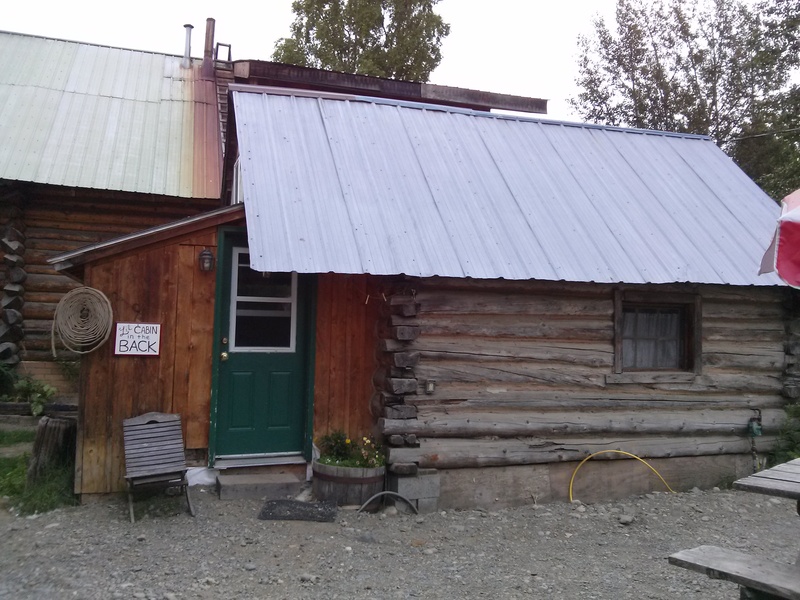 I did, however, take a snapshot of where we spent two nights – the Lil Cabin in the Back behind the Talkeetna Roadhouse. When Mark made our reservations to stay in Talkeetna, he warned me that there were few places to stay and that the only available place was the Lil Cabin, which did not have its own private bathroom. Sadly, I am a person who cannot make it through the night without a trip to the facilities, so I wasn’t too excited about this. But we were assured that the bathroom was just a few steps outside. Joy. I have never thought it was a great privilege to shower as many times as I liked when I stayed somewhere. 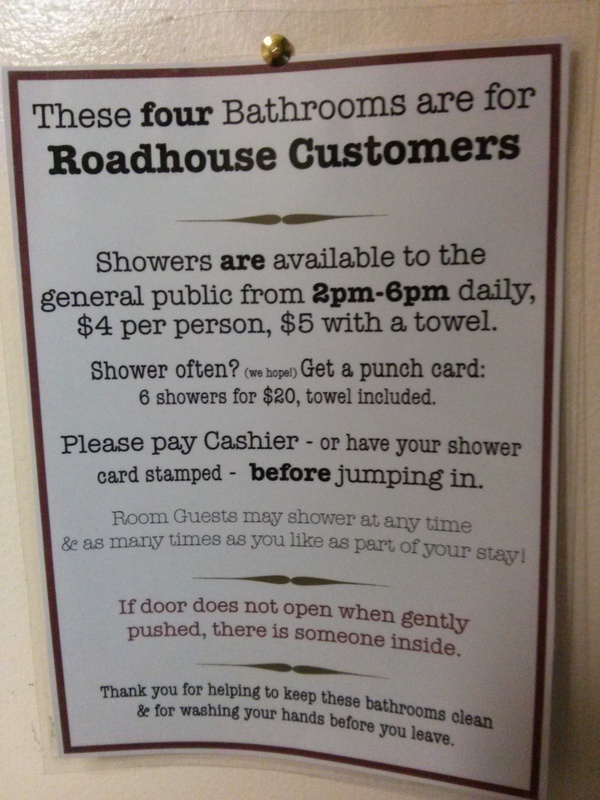 And to have a towel provided at no extra charge. But it genuinely is. And here’s another bit of trivia, the cable tv show Man vs. Food recently came to the town, and to the Roadhouse, to film an Alaska segment. Check it out, it’s pretty cool. 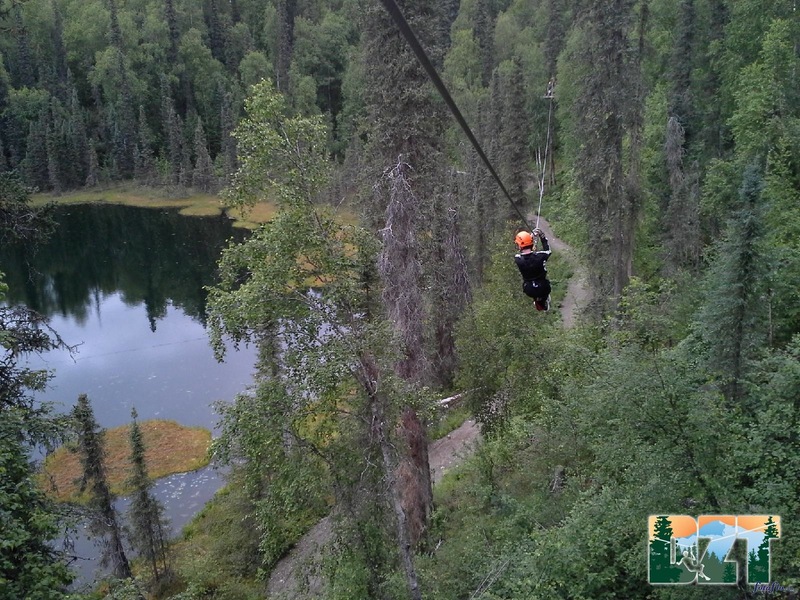 The first activity on our agenda was zip lining, something that I have never done before. Mark and the older kids had done it in Zambia, when we went to Victoria Falls. I opted out that time. This time, however, the whole family signed up. I have to admit that it was a lot of fun. Even Kate, who was extremely apprehensive about it, ended up having a great time despite her light weight (she had to pull herself across to the end a few times because she didn’t weigh enough to make it all the way across). 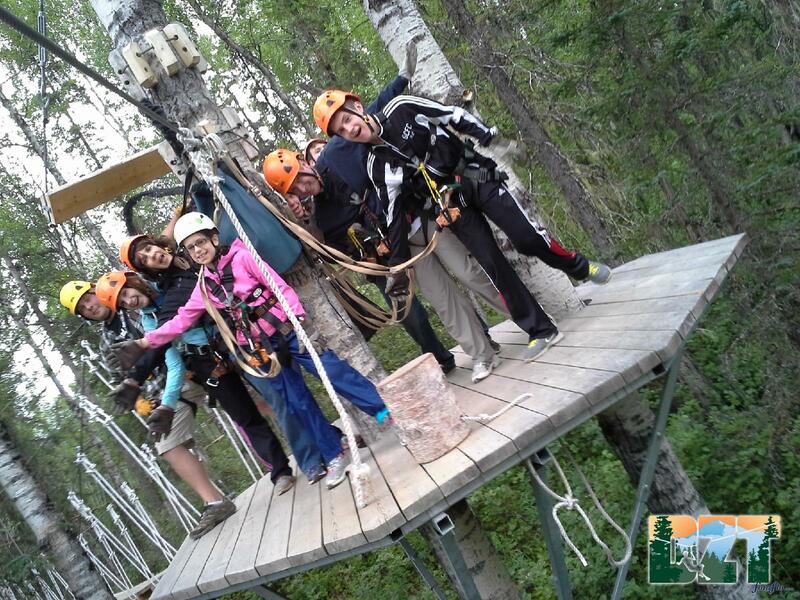 Here we are on a platform, waiting for our next zip through the trees. We’re supposed to be pretending to fall off the platform. I thought the scariest part of the whole experience was crossing over a few bridges like this one. I’d rather be on the zipline than walk on these rickety things. 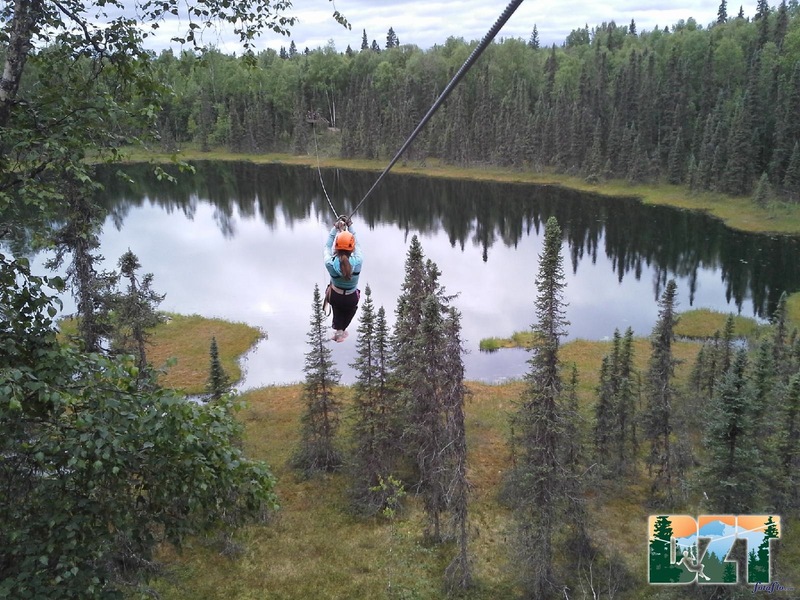 After zip lining – nine zips through the treetops in total – we headed back to town to eat and then rest up for our next day’s adventures – river rafting and kayaking. Thanks to Groupon. Here’s my shameless plug – we owe it to Groupon for last weekend. That was what gave us the incentive to travel to Talkeetna. Good deals are a great motivation for trying new things. We started out the next day at 6:45 a.m., when we were picked up for our journey into Denail’s state park (not to be confused with the national park) for our kayak experience. Sarah and I teamed up in a double kayak, Mark and Kate were in one together, and Kyle was in a single. 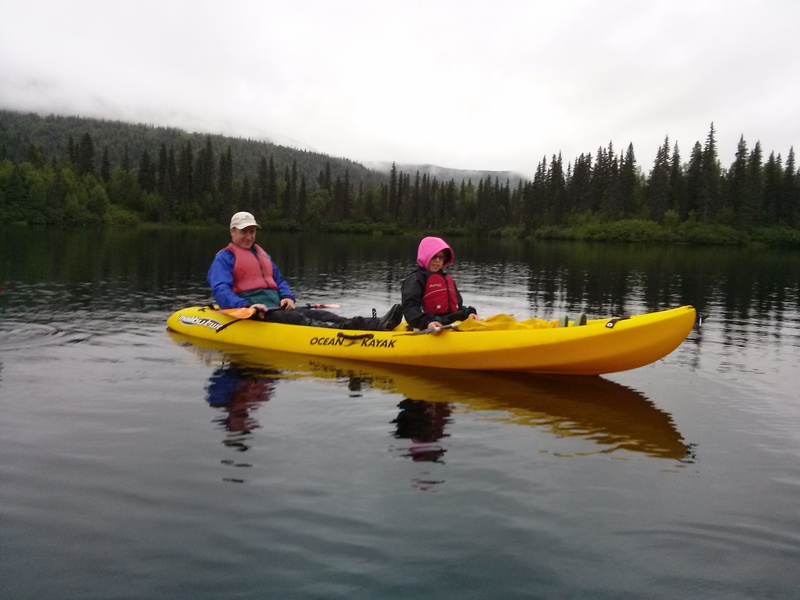 We had a very experienced guide who lead us around a ten-mile lake where we spotted a loon and a pair of trumpeter swans. And discovered that we had extremely sore arms and shoulders afterwards. After the kayaks, we took a break for lunch and then began the river rafting segment of our trip. This was not white water rafting but a very easy float down the river. With a very muscled guy doing all of the rowing. Thankfully. We didn’t have the incredibly sunny weather that we’ve had so much of this summer, but at least it didn’t rain during any of our activities. 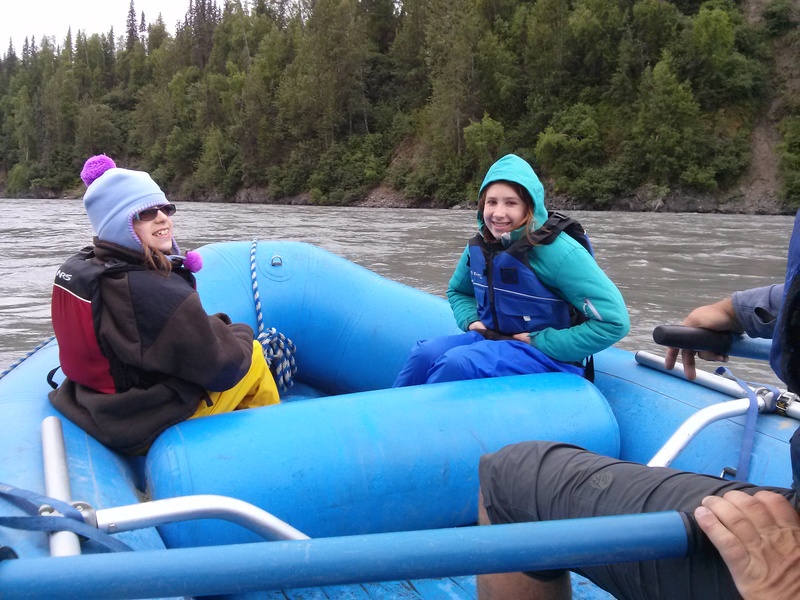 The rafting was fine, we saw some beautiful scenery including several eagles, but it was actually pretty uneventful for the four hours or so that we were on the raft. We all agreed that we want to try white water rafting sometime. Just call us thrill seekers. 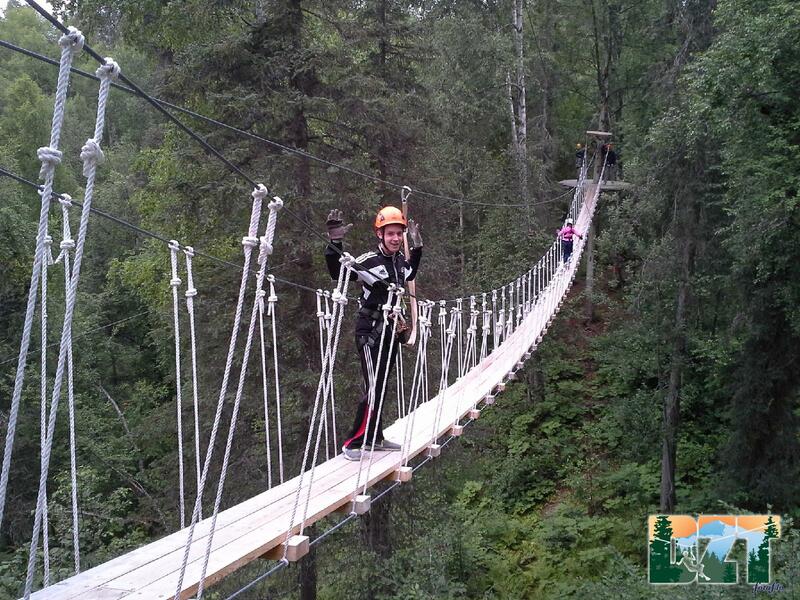 All in all, Talkeetna was great fun. Would I go back again? Absolutely. My Fish Was This Big! Ahh, summertime. Soaking up sunshine, swatting mosquitos, taking road trips. Telling the teenagers to get off the internet. Taking the teenagers to get driver’s permits. And watching my son catch a fish nearly as big as I am. This pretty much sums up my summer so far. I have never been fishing in my life (unless I went as a small child and don’t remember it). I have also never really cared to go fishing, but when you live in Alaska, it’s something that everyone should try at least once. I also don’t like to eat seafood at all (probably one reason I never wanted to go fishing), but again, in Alaska, salmon and halibut are served everywhere, from restaurants to dinner parties to outdoor barbeques, so if you don’t eat seafood there is a very good chance you will go hungry in certain situations. I know the health benefits of consuming fish are numerous, so shortly after moving here I decided to give fish another try. I’m still not that fond of salmon, but halibut is actually good – it’s definitely the least fishy tasting of the two. So when Mark told me about a halibut fishing charter that someone from his office was organizing, I agreed to give it a try. At least I wouldn’t mind eating our catch. Last weekend we packed up and headed to Homer, a small town that proclaims itself to be the halibut fishing capital of the world, and prepared to get up early the next morning to head out on our adventure. I was a little nervous about a couple of things – spending six hours on a small boat with no bathroom, and getting seasick. So I only drank half a cup of coffee that morning and took Dramamine, and thankfully neither turned out to be a problem. 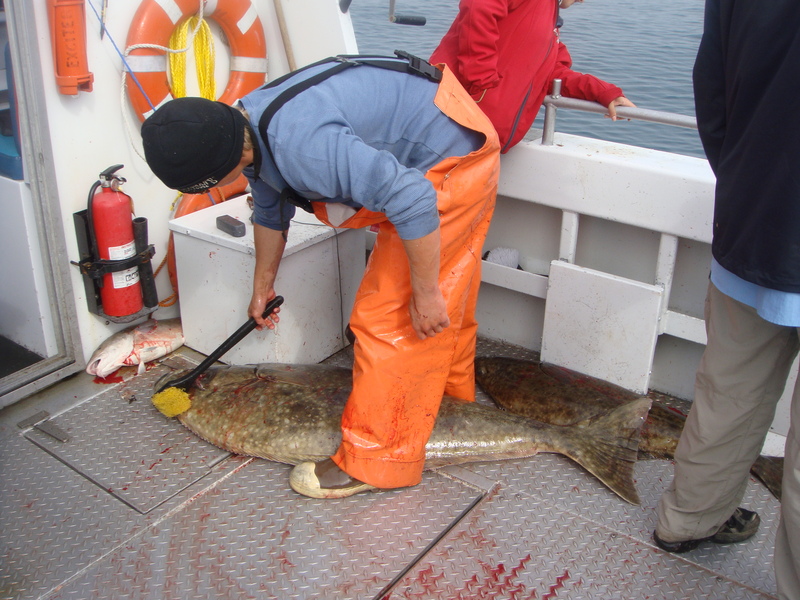 In case you don’t know (I didn’t before actually experiencing it), halibut fishing is done out in the ocean, and the fish are bottom-feeders. Which means that you need a lot of upper body strength to reel in your fishing line all the way from the bottom of the ocean when you feel a tug on your line. Unfortunately I have spent zero time in the gym working out my biceps and triceps, so I was sore for about three days after fishing. But Kyle’s been working out so he could handle the catch of a lifetime. Mark and Sarah, waiting for a bite. The deckhand whacking Kyle’s fish on the head to make sure it was dead. Next to it is the largest fish caught up to that point, which we all thought was huge. Before Kyle’s catch, anyway. Here’s Kyle and the captain, who struggled to hold up the 95-pounder. 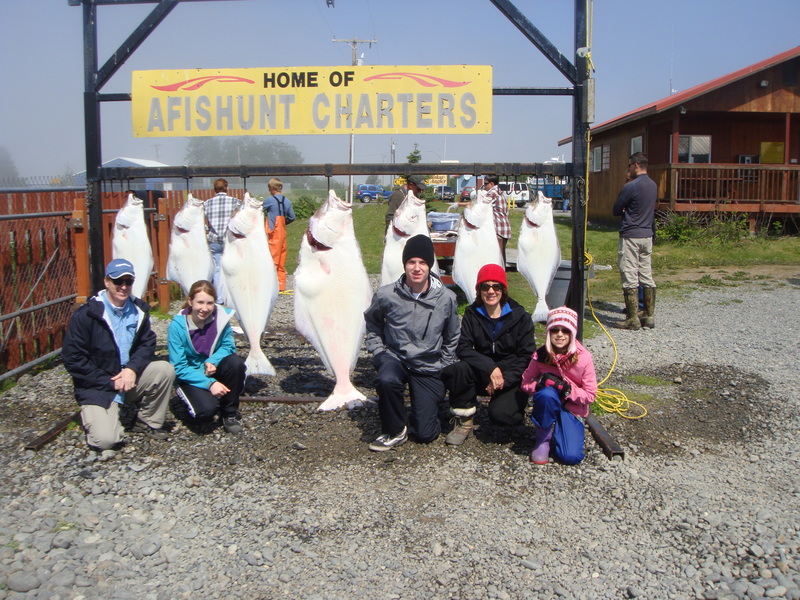 Our family posing with some of the halibut that we caught. 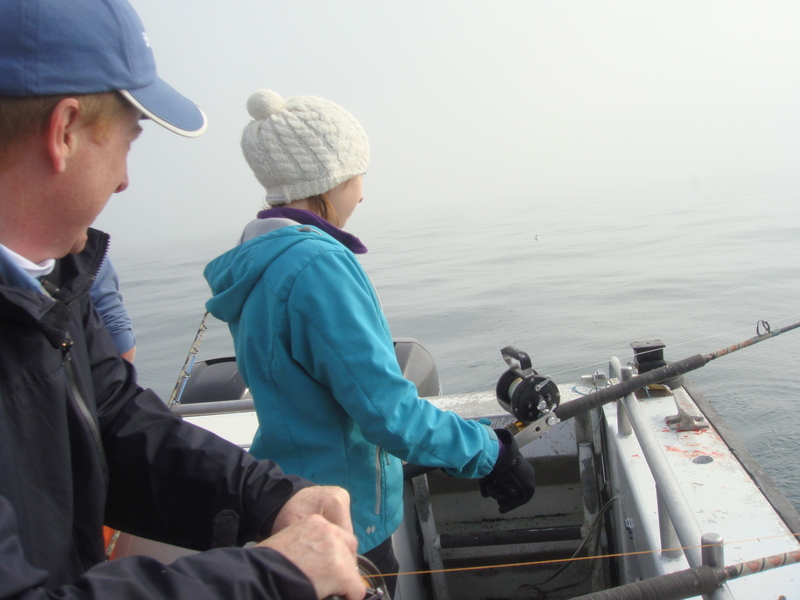 Kyle is next to his fish, and Sarah is next to her big one – a 50 pounder. I have to admit, I had a lot of fun and it was tremendously exciting when we all realized the size of fish that Kyle had on his line (there were ten of us on the boat, including the captain and deckhand). When the captain yelled at the deckhand to get the harpoon ready and then grabbed his pistol and donned ear protection, we knew something big was about to happen. And it did. 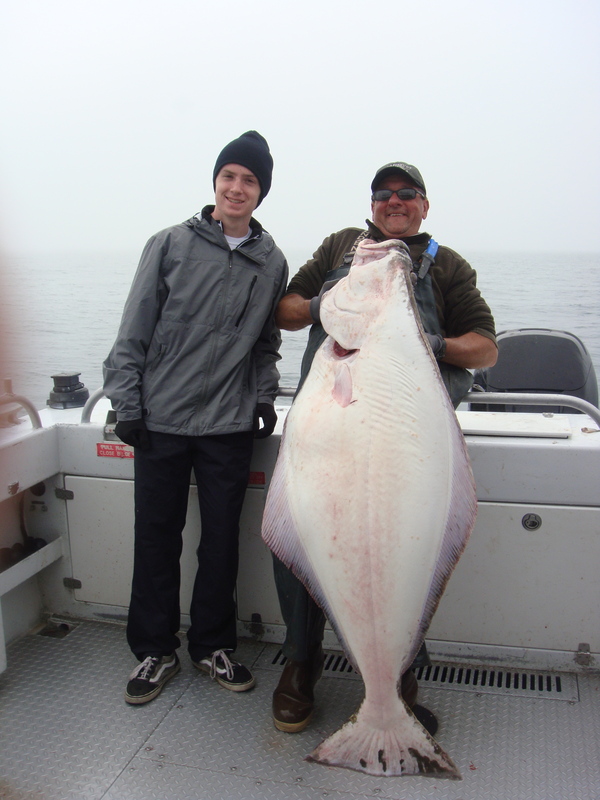 All of us on the boat caught our limit of fish, which is two per person, and we now have over 100 pounds of halibut in our deep freeze. So if any of you have any good halibut recipes, please let me know. We’ll probably be eating it for the next year. My post wouldn’t be complete without a remark on more record-setting weather. We broke the record for the most days in June that were over 70 degrees – we had 17 of them. Amazing. So far, July has been typical – overcast, a little rainy, and in the 50s. Which made for a fairly uneventful July 4th. We also had no dark skies for fireworks, so we celebrated inside with good food, fun games, and a lot of family time. Which is not that bad of a way to celebrate. We did, in fact, set another weather record. On Tuesday of this week, we broke the record high at an official 81 degrees. My car actually registered 84 degrees in one part of town. And at one of the smaller airports, 86 degrees was recorded. We had windows open, fans going, and I actually put on shorts and a sleeveless top that I hadn’t worn since we moved here from Angola over two years ago. I even painted my toenails and wore sandals for a few days. It was short-lived, however; now we’re back to the more typical weather of mid-to upper 60s. Today it is around 55. But it was freakishly hot for awhile, and it really felt like summer. 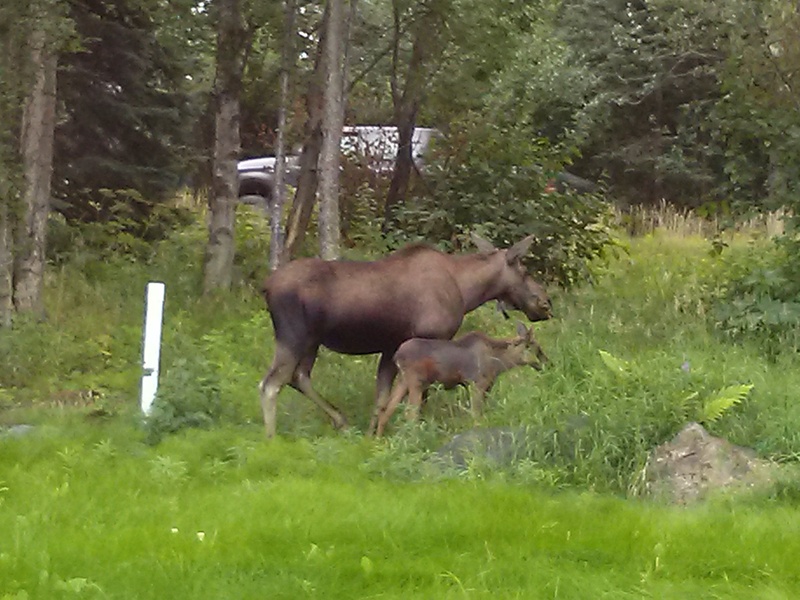 In other news, I was driving around a nearby neighborhood this morning and saw a mama moose and her two babies, chowing down on some unsuspecting person’s beautiful flowers. This is my excuse for not having flowers in my front yard – it would only be a salad bar for the moose. This has got to be another record – it is in my book anyway. We have had day after day of sunny, 70-degree weather and it has been fantastic. We’ve thrown the windows open to cool the house and headed outside to bask in the glorious warmth. I’ve even worn sandals a time or two and left the house without any kind of jacket. Incredible. This is our third summer in Alaska and is easily the warmest. Last summer we opened the windows once, I think, and I didn’t even consider wearing sandals or shorts. Here’s a picture of the girls in the hammock we bought for the backyard. We’ve already had a few arguments over whose turn it is to use it. And I’ve taken my fair share of turns. First stop after arriving at 5 am – Krispy Kreme doughnuts. My deprived children had never had one of these doughnuts. It was heavenly. The next stop – the original Starbucks store. I was in awe. Three very tired kids on our first day – we had caught a red-eye flight and later in the afternoon they all begged to take a nap in the car. For some reason, there are huge pigs like this one in various locations in downtown Seattle. So we decided to take a photo with one. We took in a baseball game while we were there, it was a beautiful but cool evening. Of course we saw the Space Needle and went up to the top and had lunch in the rotating and very spendy restaurant. But it was an overcast day so I didn’t get a good picture. Now we’re back home and giddy about the summer weather. Any lack of posts mean that I’m outside enjoying a fabulous Alaskan summer. I’ve taken the flannel sheets off the beds, pushed my wool socks to the back of the sock drawer, and can walk outside without a jacket. In Alaska, that means summer time is here. The snow is completely gone and the past few days have been gloriously warm and sunny. On Memorial Day we reached 74 degrees, which is warmer than it was any day last summer. I’m hoping we’re in for a long stretch of beautiful summer days. We deserve it, after the longest season of snowfall ever in Anchorage. Again, another weather record was set. We had snow from September through May 18. Nine months with snowfall. That’s a lot, even for here. I began writing this post from the waiting room at an oral surgeon’s office. Incidentally, the surgeon is a dead ringer for George Clooney. But that’s a meaningless bit of information. Poor Kyle had to have his wisdom teeth extracted, all four of them. His dentist had been saying for two years now that he needed to get them out, so I finally scheduled it. I figured it would be best to get it out of the way at the beginning of summer. Kyle pulled through just fine, the surgery only took 30 minutes. I had brought my book and laptop to the surgeon’s office in preparation for a long wait, but it went quickly and smoothly, thank God. Now he’s recovering at home and we have nothing on the calendar for a few days. Speaking of the calendar, it has been a very busy month wrapping up school. The kids’ last day of school was May 23, which is also Mark’s birthday. Kate didn’t do a lick of work that last week but had Field Day, an outing to a local park, an end of school party, etc. The most she accomplished was cleaning out her desk. But Kyle and Sarah had finals all week, and studied hard for them. I think Kyle may finally be realizing that it helps your GPA to study hard all school year and not just at test time. Maybe. a trip to the Downtown Soup Kitchen. Kate and I went to volunteer, along with the rest of her class. It was an enriching and eye-opening experience. The kids served soup and sandwiches and sang songs for the “clients”. I nearly cried when some of the men started singing “Jesus Loves Me” along with the kids. volunteering in Kate’s classroom doing something new – listening to the children recite the Bible verses that they had memorized. Each week they memorize a passage of Scripture and then recite it for a grade. They had been working on Romans 12 (yes, the entire chapter) and parent volunteers were needed to listen to each child recite the passage individually. This was a remarkable feat for the children, and I was blown away at how well most of them did. It was good for my soul to hear that passage over and over too. finishing up sports. Kyle finished his soccer season and Sarah wrapped up track. Sarah also was elected Secretary of the Freshman class for next year’s Student Council. She will be great in the role, I’m sure. cleaning out lockers at school. Sarah found a missing pair of tennis shoes that had disappeared weeks ago, apparently to the dark recesses of the bottom of her locker. And Kyle discovered that a peanut butter and jelly sandwich will turn moldy after weeks of neglect. He also found his scientific calculator, which had been missing for months. He had been borrowing another student’s calculator because he thought he lost his. Evidently lockers have the capability of swallowing items for weeks or months and then regurgitating them unexpectedly. getting more snow. On the aforementioned May 18, we got another dumping of snow. This was also the day of a huge neighborhood garage sale in my part of town. True to Alaskan form, the garage sales went on despite the snowfall and temperatures in the twenties. I braved the weather for a couple of hours, along with hundreds of other people. One house played Christmas music to draw customers. Another sold coffee and hot chocolate. I didn’t find too much, but it was fun to experience bargain shopping in the snow. seeing Mary Poppins. Last weekend we went to see the Disney musical adaptation of Mary Poppins, it was phenomenal – Mark occasionally gets free tickets from his office for events like these. Kyle was off camping with a few friends and missed out (he wasn’t too sad about it), but the rest of us throughly enjoyed the spectacular show. Coming out of the theater at 10:45 pm and seeing daylight – that’s the most obvious sign that summer is here.